Carte des Cotes de Barbarie ou les Royaumes de Maroc, de Fez, d'Alger, de Tunis, et de Tripoli avec les Pays Circonvoisins. 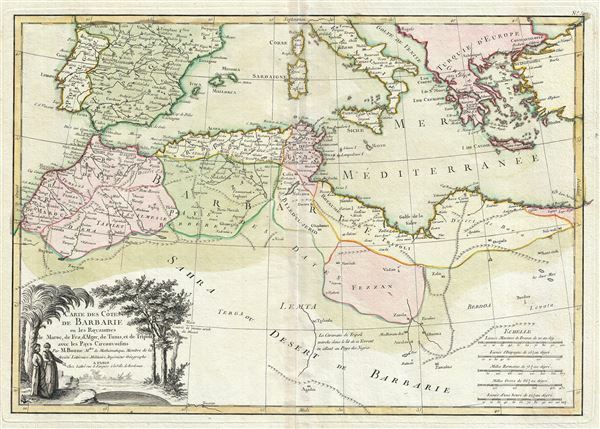 This is fascinating example of Rigobert Bonne's decorative 1762 map of the Maghreb or Barbary Coast. It covers northwestern Africa and the western Mediterranean. This region consists of the modern day nations of Tunisia, Libya, Algeria and Morocco. The map offers excellent detail throughout showing mountains, rivers, national boundaries, cities, regions, and tribes. A large decorative cartouche appears in the lower left quadrant of the map. This map was drawn by R. Bonne and included as plate no. 30 in the first edition of Jean Lattre's 1762 issue of the Atlas Moderne. Rumsey 2612.064. Phillips (Atlases) 664. National Maritime Museum, 215.